Ubisoft announced release dates for "Eagle Flight" and "Werewolves Within," too. Ubisoft has dropped the dates for three of its incoming VR games, including Star Trek: Bridge Crew. That title, set in JJ Abrams Star Trek universe, is available for pre-order and arrives on all three major platforms, the Oculus Rift, HTC Vive and Sony PlayStation VR on November 29th. It lets you take on the role of captain, engineer, tactical officer or helmsman on the Enterprise-style "Aegis" bridge. The aim is to work with your crew mates to help settle Vulcan's remaining population after the planet was destroyed in the first Star Trek reboot. Eagle Flight (above) is another intriguing title that we first saw (and fell for) at GDC 2016 in March. 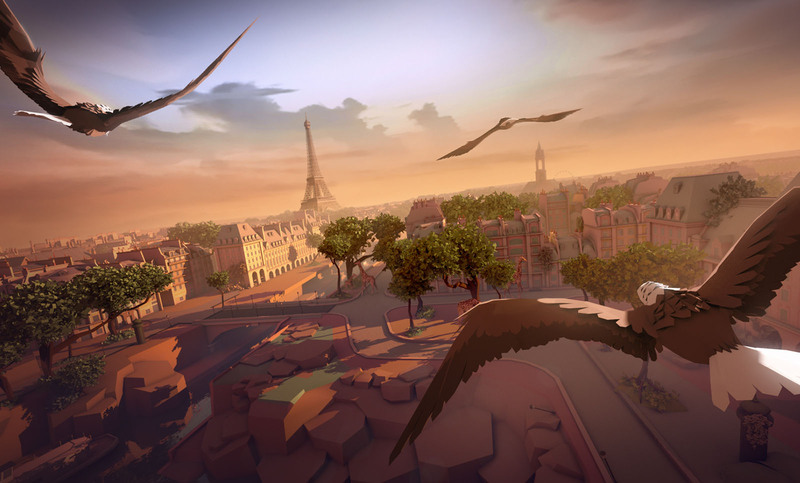 You pilot your very own eagle over the skies of a futuristic, overgrown Paris, playing either in teams or solo. The whimsical goal is to pick up a dead rabbit or other prey and bring it to your home nest ahead of rival birds. Engadget editor Nicole Lee called it " immersive, fun and surprisingly social." It's now on pre-order and arrives October 18th to the Rift, November 8th on PlayStation VR, and to the HTC Vive on December 20th. The last title is Werewolves Within, "a game of social deduction that brings the competitive fun of game night with friends to virtual reality," according to Ubisoft's PR. Every game is different -- in one, you're innocent, trying to convince others you're a non-werewolf, in another, a legit half-lupus lying to avoid the villagers' wrath. Also available on pre-order, it hits all three VR platforms December 6th. So, if you're running out of activities for that pricey headset, you at least have something to look forward to.